Disclaimer: The content of this site is intended to provide users with resources and information which they may find useful and of interest. Though we strive to keep this information current and accurate, errors may occur. The information on this site is therefore provided as is with no guarantee of accuracy, completeness or timeliness. Links, documents or organizations referenced from this site which lead to information maintained by other organizations are provided for the sake of convenience. 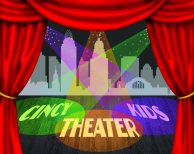 CincyTheaterKids does not endorse the information provided, nor activities referenced, herein or at any links, and does not provide any warranty regarding the accuracy of any other aspect of the information or activities provided on these sites.